The Foreign Office has advised Britons against all but essential travel to Fiji because of the prospect of a military coup. Armed forces chief Commodore Frank Bainimarama has given the government an ultimatum to fulfil a series of demands or face action. Australia has warned there is likely to be a coup during the next two weeks. The Foreign Office is also warning any Britons already in Fiji to avoid rallies and other large gatherings. Previous advice was not to travel to the capital to Suva, but that has now been extended to the whole island. A Foreign Office statement said: "The Fiji Military Commander has issued a number of ultimatums demanding that the government resign. On 21 November, the commander announced that military action would be taken if his demands were not met by 4 December 2006. "On 25 November 2006, all military reservists were recalled and there is now a strong possibility of a military coup taking place in Fiji." The military's demands have included the resignation of Prime Minister Laisenia Qarase's government after anger over plans to offer amnesties to those involved in a racially-motivated coup six years ago. 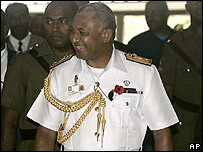 The proposal, which has now been dropped, was bitterly opposed by Commodore Bainimarama, who was the main target of the coup, and was forced to flee for his life. The other demands include the removal of Police Chief Andrew Hughes, an Australian who is believed to be close to laying sedition charges against Commodore Bainimarama for his repeated threats to forcibly remove the government.